Offering you a complete choice of products which include pulse oximeter, ecg machine, multipara monitor and fetal doppler. Automatic Power off when no signal is detected for 5 sec. 12 channel format recording Built-in USB. Adapt to 215mm roll paper and 210x140mm Z-fold paper. 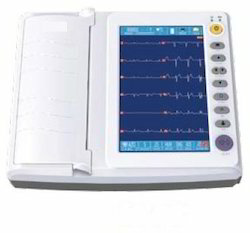 Anti-Drift Filter: 0.15Hz (Adaptive) CMMR ≥100dB (with AC Filter) Input circuit Floating; Protection circuit against Defibrillator effect Input impedance ≥50M Input circuit current ≤0.05µA Patient current leakage ≤10µA Calibrating voltage 1 mV±2% Voltage tolerance ≥±500mV Time constant ≥3.2s Frequency response 0.05~160Hz (-3db) Noise level < 15µVp-p Inter-channel interference ≤0.5mm Sensitivity Auto, 2.5, 5, 10, 20, 40mm/mV Recording mode. We offer wide range of Multipara Monitor. It is with compact appearance, comprehensive functions, simple and convenient operation, and widely used in hospitals, community medical treatment and family. ultrasonic Fetal Doppler meets the fetus daily check and routine examination at home, clinic, community and hospital.